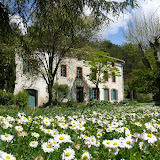 Hespérie, Aurore and Daphnis, with their 3 bedrooms, are ideal gites for 5 or 6 people. Each self-catering cottage is independent, has a private terrace with BBQ area, a sitting-room with books, satellite television, DVD player and hifi, a dining area and a fully equipped kitchen (with dishwasher and washing machine). Free access to high-speed internet. Dinner can be served on night of arrival (please request when reserving). Bed linen and towels provided. Children's cot and highchair upon request. Smoking is not permitted inside the building or around the pool.